Rose City Office Furnishings is proud to be the Portland area’s number one source for office furniture. We have helped hundreds of Portland companies outfit their offices with the office furniture that fit their needs best. From complex modular workstations and cubicles to a simple private office setup, we are here to help. Our office furniture specialists can assist you with laying out the entire office from the open office areas to the conference and lunch rooms….and everywhere in between. Portland’s best source for office furniture has workstations and cubicles that are stylish, modern and empowering. The smooth, well designed surfaces are pleasant to work on and the design options available are thoughtful. These are like mini-offices instead of the cubicle and workstations of the past. Our Brands offer well-designed products with high caliber functionality, which helps to empower the people who work for you. The innovative designs offer easy access to work surfaces, storage and enables accessorizing for ergonomic applications. The styles and brands that we offer feature modern convenience and color schemes that brighten and enhance the work environment. offers both traditional pieces and modern styles that allow you to maximize the number of workspaces within a designated area. The well-made pieces are sturdy and constructed of materials that are made to last and yet can also be sustainable. offers a modern twist on the traditional styles. The bold colors that accent the work area are bright and cheerful and can liven up the work space. The modern designs allow easy additions such as elevated storage that does not take up working surfaces. AIS produces products that are quality manufactured and easy to install and adjust. The key benefit of AIS is that their designs give you more storage, and work space than most other designs even though the square footage is the same. Maximize your space with AIS. Are modern. They feature rounded corners and soothing tones that help to calm and focus attention on work. Friant offers a large selection of accessories such as off-the-desk work organizers. The rounded corners mean fewer walls and more of an open area that promotes collaboration through thoughtful design. Benching is an easy way to maximize work space when you have a narrow office. It is also a good design tool to improve the flow of your office. Benching is a tool that is used to install a workspace that is open, yet defined. Desking can allow you to add additional work space for employees who handle a lot of tasks without setting up a cubicle. Most desking options allow for the incorporation of filing systems as part of the structure or as secondary pieces. Enhance and empower your workforce with well designed and quality desking and benching options from Rose City Office Furniture. 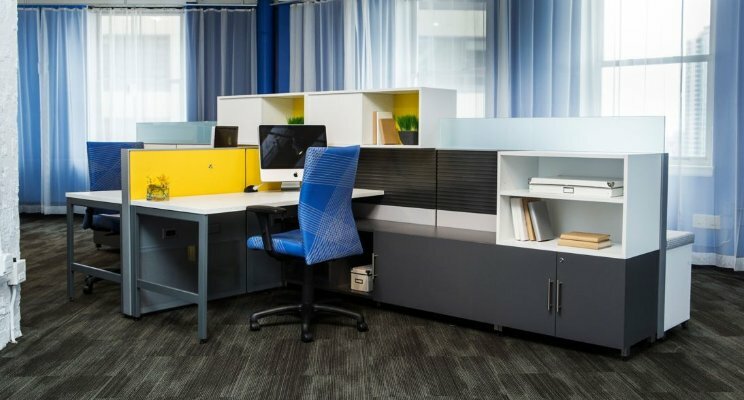 The benching options from Maxon offer cozy, functional spaces that are light, easy to maneuver around in, and yet designed to accommodate storage, accessories, and your workers. The benefit of Maxon brand is that it offers many different looks, shapes and styles throughout its product line. All are well made, and many contain sustainable materials. Offers modern styles that blend traditional design with the needs of the modern office. Find that classic look with an all grown up feel. AIS products are also well made and constructed of quality materials. AIS designs are all about function and purpose. Creative benching styles allow employees to work and collaborate, but also can add a positive dimension to teamwork and team building. Private office space is the envy of the entire workforce. It is a goal for which to reach. Offers traditional designs with quality wood and wood-like products that are stylish and richly appointed with details. From desks and hutches to credenzas and tables the power that flows through a well-designed office is palpable. HON offers a variety of styles with quality that could be found in the largest company’s CEO office. Modern and comfortable designs with collaboration and sustainability in mind. With over 80 years of experience, they have mastered the art of making products simple, purposeful, and personal. Create spaces that are functional, unique and polished with OFS. Outstandingly rich designs with masterful materials that are pieces of art and yet they function perfectly in an executive office. This is the line of products that offers a writing surface that has depth and brilliance. These are the products that ground you, but allow your creative nature to work. A private office should enhance the strengths of the person who works there. It should elevate and support while it allows your extreme focus and talent to shine. All of our private office products have something personal to offer to your executives and leaders. All are finely crafted and made from quality materials. If you’d like help finding the perfect office set for your private office, contact us now. We are easy to work with and ready to help. These spaces are larger and hold more furniture than most other areas, plus it is private. When you think about what a private office should do for the person who uses it words like creative, energetic, powerful, rich, stylish all come to mind. The word that is missing that list is practical. You can create a practical work environment that is creative and energetic while showing power, style and wealth. Empower your leadership to be all of those things in an office that helps them achieve their goals. Versatility and flexibility are two components of work areas that empower employees to excel at their jobs. This is where the idea of design impacts productivity. Versatile workspaces allow employees to achieve the most comfort by being easily adjustable. Designs include adjustable desks, chairs and accessories that offer each worker the flexibility to sit or stand and still maintain a productive working environment. We offer top brands and designs that are inspiring and safe to use. Even at their highest elevation these brands will remain stable. Many of the Sit-Stand desks are electric and offer an even greater range of flexibility than a standard desk or even a sit-stand desk that elevates in set increments. These high caliber office furniture designs accommodate employees of all sizes, heights, and those with special needs. The key is function, and smart designs mean excellent function. Our brands include names like HON, ErgoFlex, ESI and Workrite Ergonomics. Each brand offers something different such at T-Shaped desks that are easy to adjust and small enough to fit anywhere. Accessories include desk-mounted computer stands that keep your system within easy reach. Other highlights include lighting that is simple to adjust and bright enough to light your work area. Thanks for visiting the Rose City Office Furnishings Website! We hope you find your visit useful and we look forward to helping you find the office furniture solution that makes your office the perfect blend of form and function. Please feel free to browse the site or simply click the button to contact us and we’ll take care of the rest! Chairs literally support us. People spend buckets of money on things like high-end athletic shoes because they need support when they run or jog. Office chairs need to have the same consideration. Chairs support our lower and middle spine and take the weight of our bodies, off our feet, legs and hips. We spend at least 1/3 of our day in a chair or a seat. Deciding what kind of seating to offer your employees and guests is important. For cubicle and workstations seating consider allowing the employee to pick their own chair or work with an ergonomic professional to fit and adjust chairs for your workforce. An outstanding chair finder tool that you can access online. The tool is handy because it allows you to sort by styles and business areas such as lobby and conference rooms. HON also offers a high caliber selection of chairs for all areas of your business. If you need a single chair or 200 chairs, HON is a hot spot to start your search. Other brands include 9 to 5 Seating, Highmark Seating and RFM Seating. Seating that is designed for workers. They have stylish designs that are packed with creature comforts and include personal touches such as fabric choice. This is an outstanding brand for highly stylized chairs. Some of the best chairs available. While all of our brand offer outstanding products that are well made, RFM Seating offers something special. Their chairs are richly appointed with top fabrics with a diversity of colors and textures. Style, trending and swag are words that come to mind with RFM Seating. Filing and storage; they are not just about putting manila files into a hanger and stuffing it with papers. There is a bit more to consider when it comes to choosing a file or storage system. An example would be a HIPPA compliant system that is designed to hold personal information that is protected by federal law. The function of the system is an important consideration. Our lobby furniture is designed to be welcoming. We offer a large assortment styles that have many levels of applications. We have seating, tables, and accent pieces that fit the casual lobby or the swankiest of corporate waiting rooms. Our products are designed to help you create an environment that syncs with your company’s brand and atmosphere. Impressive designs from brands like Ergo and HON. The designs from Ergo begin with quality materials and are designed to stand up to use. These are pieces that are made to impress. Ergo uses color and texture to help you create an up-scale look that oozes refinement and culture. The assortment of lobby furniture from HON has applications throughout an entire organization. Their designs are functional, comfortable, and manufacturing features quality materials. HON and Ergo design quality furniture that is purposeful, comfortable and easy to maintain. There are styles and designs from these brands that can be put in all levels of lounges from your basic lunch room to the posh lounges of the upper echelon of those in power. Give your employees a place where down time equals recharging so when they return to work they are energized. Presentations: We focus on all of the products that you need to give presentations. From seating and tables, to hospitality carts, lecterns and buffet credenzas we have it all covered. Brands include HON, Cherryman Industries and Global Total Office. Each brand offers multiple levels of conference room furniture with quality manufacturing and options for a wealth of surfaces, styles, designs and materials. Lighting makes all the difference when you think about keywords like creativity, motivation and empowerment. How you light the work areas of your workers is important. We offer a wide range of lighting and accessories that are designed to help you create the perfect work space. An example of a different style of lighting is found in LED lights. These fixtures use less energy, produce clear white light, and do not put off heat like a halogen lighting fixtures do. The light is friendly to the employee and to the environment. When you cannot have natural lighting, then substitute the next best thing.